Brampton. A big social media push to support the club in big numbers proved a worthy one with a big entry on the day. Its almost a given these days that a fantastic race track is prepared for the riders at Brampton and today was to be no different. You have to respect the 65cc riders who were first up onto the hillside circuit. Unless you have been to Brampton or tried to walk up some of the hills its hard to describe how tough it is, but these youngsters take it all in their stride and produce some fantastic racing. Ryan Waggott was the one to beat after holding off a strong challenge from Bobby-Jak Ennis in race 1, his 1-1-3 scorecard was enough to take the overall. Ennis was to take home the 2017 club championship by taking moto 3. Liam Johnston completed the podium with a 3-3-2 day. tumble. The top 4 in the class were only split by 7 points, Corey Hamilton finished the day strongly with second and Jay Cheel from the North East in third. In the Big Wheel class the big crowd were treated to some great racing especially race 3 between Northern Ireland’s Ryan Mawhinney and Buster Hart from the North East. Hart came out the winner in that battle however, it was Mawhinney taking the overall including a best lap time in moto 1 that would have placed him within the top 8 in the A class. Ryan Quirk got a full house of third places to take third overall back to the Isle Of man. Great to see so many new riders travelling from near and far especially in the 85 class, we hope to see you all again in 2018.
and 2, unfortunately a final race tumble with a back marker meant Ryan had to settle for third overall ahead of a trip to Weston Beach race this coming weekend. The first 2 podium places were taken by the Planet Advanced Racing suspension pair of Andrew Pohlen and Sam Donnan building for what appears to big seasons for the pair in 2018., good luck lads. The Youth Championship battle went down to the final stages of Moto 3, it was West Cumbrian Ellis Murray the victor ahead of Jack Harris after some great battles this season. It was great to see James Hutchinson returning from injury and enjoying his racing in the A class. 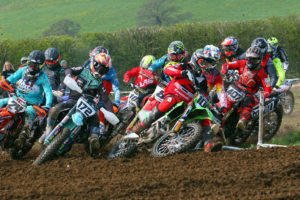 After a third place in moto 1, he backed those up with 2wins and some close racing with fellow North East racer John Robson as the track got rougher to take the overall on the day ahead of Robson. Making it a Honda 123 on the box was local Joe Hodgson, Joe to moto1 victory and in doing so the East Cumbria Mx A class championship. The Alston duo of Martin and Shane Boylan were to take 2podium places in the adult B class. Martin recording a perfect 1-1-1 in the process with Shane in third. Zac Milburn was the man to split the duo with a 3-3-3 scorecard. Second place race finishes for the fast starting Andy Craig and Veteran Ewan Johnston were unfortunatly not enough to make the podium in the ultra competative B class. The Championship was to be taken home By Ben Walsh adding the title to his Acrebis Nationals title. Steven Riley was once again the man to beat in the C class. Rileys 2 race wins was enough to take the overall. Mike Johnston was to take the second podium step and taking moto2 victory in the process, and was all smiles on his clearing lap. Another returnee was Molly Wernham and she was an impressive third place on the podium. Last but by no means least is the Auto class, a new track layout for the 17 racers proving the switch from the main track back to the grass a popular one and a great stepping stone for the kids several of whom this was their first race, Malachi Allen completed the season with another 3 race wins making the trip from Scotland worthwhile. Local lad Mason Currie was second overall with Louie Pritchard completing the podium in third. Hopefully see you all in 2018 and further grow the reputation of Brampton being one of the premier sand tracks in the country.